Home>Browse>Books>Children's>Children's fiction>The Cursed First Term of Zelda Stitch. Bad Teacher. Worse Witch. It was bad enough when I was eleven years old. But if they sniff me out now, it'll be a disaster. 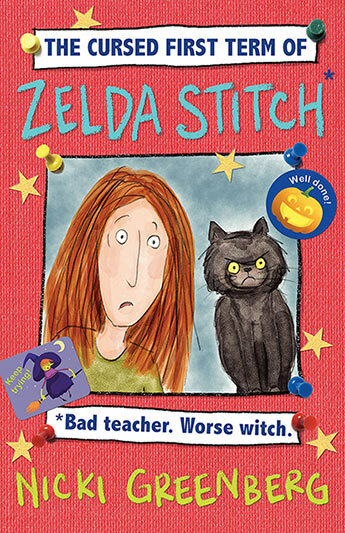 Zelda Stitch isn't much of a witch - she's hoping she'll make a better primary school teacher. But if the vice principal finds out about her, her dream will go up in a puff of smoke. With NO HELP AT ALL from her disagreeable cat Barnaby, Zelda must learn to be a better teacher, a better friend and a better witch - even if that means taking broomstick lessons. Magic. Mischief. Mayhem. Zelda's classroom is a cauldron full of laughs.